On the Mat: There were times when I would progress in astonishing ways and then suddenly it would be as if I was starting from scratch. These setbacks tested my patience and brought up doubts as to if I even had the skill set to ever do this. Regardless of what happened the day before, I just kept going at it. Off the Mat: We can use “good” or “bad” to describe how our development is going but those are actually judgments. Persistence is a sign of dedication. It’s intention in action and it’s a vital component to achieving any goal we’re going after. On the Mat: I didn’t realize it at first but really I’ve been building a new connection with my hands and arms for them to now be an infrastructure of sorts. And now, something is different. Especially with my hands. It’s subtle but there is a strength and steadiness that wasn’t there before. Off the Mat: Our relationship with anything is a sense of trust to varying degrees in how we can rely on it and how it serves us. Whether that is with ourselves, a skill set, or with people it takes time for the intricacies of a bond of confidence to form. There’s no way to rush it. We have to let it unfold as it will. On the Mat: I lost count of how many workshops I took over the years, even from some pretty famous teachers. Not everyone’s tips and tricks worked for me but that’s part of the learning. It’s a process of attempt, evaluate, and let it go if it doesn’t serve you. What is right for someone else, is unique to them. Off the Mat: We often receive unsolicited advice about what we should or shouldn’t be doing in our lives, which may be in the form of society’s values or a relative’s perspective that may be more about them than us. It’s ultimately our responsibility to make a choice that’s best suited for, and that supports our own authenticity. On the Mat: I made very little progress when I only practiced the pose when it was offered up in class. It wasn’t until I came up with a plan of my own to take this to a new level; to practice at home and before class, to do more core work, and to supplement with the right nutrition that I really began to see improvement. Off the Mat: As great as our teachers or mentors can be in life, we’re ultimately responsible for the advancement toward our goals. We have to take proactive ownership on our own initiative rather than waiting for things to come to us. 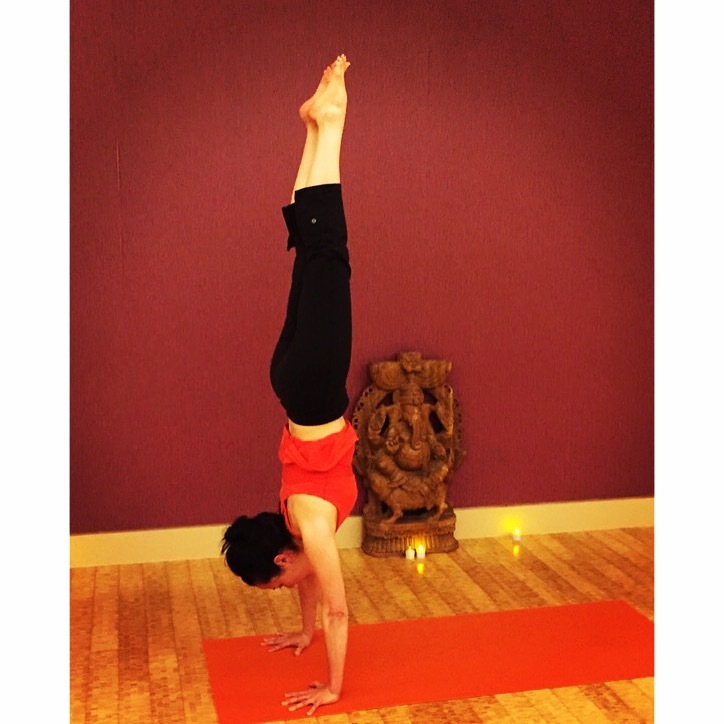 On the Mat: What is the one thing that everyone is afraid of in an inversion? Falling! Yep, I had to face it head on by practicing with it. So I got away from the wall and trained in the middle of the room. The more I fell, the more comfortable I was with it. Off the Mat: Fear is the most debilitating ailment we can succumb to. In the darkness of our insecurities, doubts, or anxiety really lies a perception of judgment, criticism, or distress that we’re anticipating is going to happen. But that’s the gap we have to cross to get to the other side. By inching forward, into the unknown, and letting each moment happen as it should, we can still advance arm-in-arm with our unease. The point is, to not let it totally blocks us from experiencing a certain fullness with life. Entry filed under: Celebrations, Courage, Gratitude, Lessons From Postures. Tags: Handstand, happiness, Living in the now, Yoga, Yoga Practice. Awesome and insightful. I’m inspired!